Israel’s Defence Ministry announced on Thursday it was banning gas and fuel from entering Gaza via the Kerem Shalom crossing, the main point of entry of international aid into the besieged strip. Defence Minister Avigdor Lieberman said that the decision aims to stop Palestinians from using kites and balloons set on fire and flown over the fence to cause damage in Israel. “The decision has been taken in view of the continued terror of incendiary balloons and friction along the fence,” a statement by Lieberman’s office said. 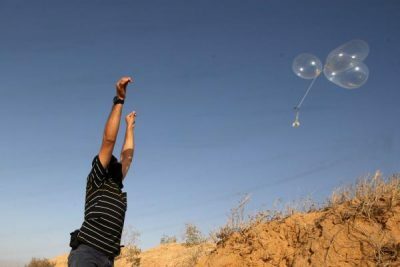 Palestinians say the balloons are a modest and legitimate means of resistance against Israel’s deadly violence and blockade of Gaza. Israel has stepped up its crippling sanctions on Gaza as Palestinians continue to regularly demonstrate along the fence separating Gaza from Israel as part of the Great March of Return. The protest campaign calls for an end to the 11-year Israeli blockade on Gaza and for Palestinian refugees’ right of return to the lands that their families fled during the establishment of the state of Israel in 1948. Since the demonstrations began on 30 March, the Israeli army has killed at least 155 Palestinian protesters, according to Gaza’s health ministry. Israel had closed the Kerem Shalom crossing and reopened it partially last week after warnings from UN officials that emergency fuel supplies are running low in the Gaza Strip. Fuel shortages and power cuts have created a dire situation for hospitals and water sanitation systems.